I use a combination of the district’s curriculum, our state’s Grade Level Expectations (known as Performance Expectations or “PE’s”), the Common Core and best teaching practices throughout the year to help your child reach the expectations for third grade. Review of daily work helps guide and individualize my instruction to meet your child’s needs. That being said, not every assignment is scored with the 4, 3, 2, 1 scoring system. On these papers, you’ll see a star, check, happy face or stamp. Student’s assessed work will receive one of the following scores: 4, 3, 2, 1. A student who receives a 4 is able to demonstrate superior performance, skill, or knowledge that is appropriate for his/her grade level and he/she has gone beyond the requirements of the assignment. A student who receives a 3 is able to demonstrate a solid performance, skill, or knowledge that is appropriate for his/her grade level and he/she has fully met all of the requirements of the assignment. A student who receives a 2 is able to demonstrate a partial understanding or accomplishment of grade level performance, skill or knowledge. A small portion of the assignment or may be missing or incomplete, but everything else is quality work. The student isshowing progress over time. A student who receives a 1 shows a lack of achievement of grade level performance, skill, or knowledge. Major portions of the assignment may be missing, incomplete, or may contain many errors. My approach to discipline is to be caring, consistent, and compassionate. I believe the best classroom management plan is to recognize kids who are setting a good example and doing their best to make our classroom a safe place that promotes learning. In my classroom, I want your child to feel safe physically and emotionally. I understand there are times when an emphasis on nurturing is the best approach and times when an emphasis on being firm and consistent is the best approach. My goal is to successfully blend the two. All students start out on the green “ready to learn” section in the middle of the chart. 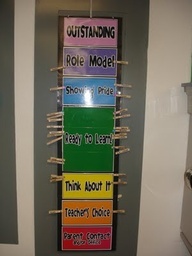 Students may move up and down the chart throughout the day. This encourages and reinforces good behavior and allows students to improve during the day as well as identifying inappropriate behavior. A “Behavior Log-Think Plan” is my way of communicating to you that your child needs our combined attention to help follow the classroom guidelines. If the problem persists, we will seek help from our school counselor, Mrs. Ballart, or Mrs. Foreman, our principal. Please be advised that circumstances such as hitting, fighting, showing serious disrespect to a student or adult will result in an automatic notice home and/or a phone call and may warrant a talk with our principal. Pearson Elementary has developed school-wide student behavior expectation called “Pearson Pride.” We will highlight one attribute and continue to refer to them throughout the year. Positive – I use polite and encouraging words to help myself and others. I am a polite role model. Respectful – I show respect by using kind words and caring actions. I work and play cooperatively. Integrity – I am honest and trustworthy. I choose to do what is right and accept the consequences for my actions. Dependable – I come to school on time and have my materials ready. I turn in work on time. I follow school rules. Engaged – I listen carefully and work hard at learning. I participate in activities to support my school. I believe communication with families is an essential part of building a successful partnership between school and home. There are several ways in which we can communicate including information in the planner or traveling folder and through an e-mail or phone calls. You will also hear about upcoming classroom and school events, requests for donation of particular items, and a general outline of concepts and learning targets for the week in our classroom newsletter placed in the Traveling Folder. It serves as my main form of communication with families. You can expect to see a newsletter most weeks which can also be found on my classroom website. Students write in their planners each day. They may write about important changes to homework assignments, information about school activities, reminders about upcoming deadlines, or new facts we have learned. This writing piece is also used to practice penmanship and editing. It is required that families read and sign their child’s planner everynight. I will check planners each morning for parent signatures. IMPORTANT NOTE: Please do NOT write in your child’s Pearson Planner about changes regarding after school bus, pick-up or day care plans. Please DO call the office (396-3750) or send a dismissal form (found on the school's website) with these changes. Also, please do NOT send me an e-mail with this information. Student emergencies, meetings scheduled during student specialist time, may prevent me from checking my e-mail until after students have left for the day. Substitute teachers do not check my e-mail and may not remember to check the planner for parent notes even if I write it in my substitute teacher plans. Therefore, it is best to have a dismissal form come directly to the teacher from the office after a parent phone call or from the student to the teacher in the morning. THANK YOU!! One of the folders from the supply list will be used to transport papers to and from school. It will be referred to as the Traveling Folder. It will go home every day and should be returned to school every morning. Returning Traveling Folders each day is required in order for your child to participate in Catch-Up and Relish (see below for more information about Catch-Up and Relish). Most papers will be sent home on Friday; however, occasionally there is additional homework or unfinished classwork, information from the PTA or office that must be sent home on other days. Corrected papers will go home on the last day of the week along with the next week’s homework. Remember to take out corrected papers and return all papers that need to be returned such as completed permission slips, book orders, homework, etc. Students reinforce skills taught in class and develop positive study habits when they complete work at home. My plan for homework is to reinforce basic skills. Homework will generally consist of a math review sheet, practicing math facts and reading. Students are expected to have a literary experience each night. Length can be determined based on what works for families. A general guideline is 20-30 minutes. This may be the child reading, an adult or older sibling reading to the child or a combination of the above. (Please call or e-mail if you feel you need additional direction.) In addition to reading each night, students should practice math facts for about 10 minutes five times a week on memorization and quick recall in addition, subtraction, multiplication, and division. Reading practice should each be recorded on a log that is collected on Thursday and will be part of Catch Up and Relish. Weekly homework will be sent home in your student’s Traveling Folder on the last day of the week and is due the following Thursday. Please feel free to turn in assignments early. Students earn Blue Slips (cash which can be spent at our Blue Slip Store) and Success Forms (notes which go home every Friday) when homework is completed. During the week students may also need to finish incomplete work or another page of math practice at home and return it the next day. You will be notified about missing assignments, homework, Traveling Folders, Pearson Planners or parent signatures via the Oops! I’ve Missed Catch-Up and Relish form (also sent home on Friday if needed). If your student receives an Oops! form from Catch-Up, please sign it and return it to school showing you've seen it. I am very firm about these expectations and review them frequently with students to ensure understanding of the expectations. Yes, we love to celebrate birthdays at school. If you wish, you may send in a special birthday snack. Please let me know a day or two ahead of time. Snacks must be store bought(this is a District policy), individual treats and ready to serve. Cakes that require cutting are not allowed. If you wish to send in juice, the individual juice boxes work the best. Invitations to birthday parties WILL NOT be passed out at school. I will send home a class list of student contact information. This list will be updated as new students join our class.